I begged off of Halloween revelry in Aspen tonight, because I'm moving tomorrow and haven't really packed... anything. So... I'm packing, right? I'm filling boxes with all my worldly belongings, getting rid of things I don't need or use, and otherwise preparing myself for this. Right? Last time I moved (at the end of June), I was packing at the last minute, in a hurry, and so everything got packed. Everything got thrown in a box and brought to my apartment or put in storage. EVERYTHING. So there's tons of crap in there that needs to be culled. It's a time in my life where I need to purge, move on, and start fresh. And yet, am I doing that right now? … another meme shamelessly stolen from Sera Strawbridge. I'm totally pilfering all her ideas. 1. Name something you have in common with all your siblings? I have one sibling and two step-siblings. The only thing we ALL have in common is our parents. My sister and I have a lot in common. We look alike, we sound alike. We both like sports. We both have advanced degrees (she's an MD) that don't get regularly used (she doesn't work full time, and I don't use mine at all presently). 2. Do you fold your underwear? 3. Who is the last person you wrote a letter to on paper? Holy crap. A cover letter with my resume, probably. I can't remember the last personal letter I sent. I was a hostess and then a waitress at The Dutch Pancake House in Memphis. I still don't know how I managed to get up at 6am every Saturday and Sunday that summer. 5. Aside from Driver’s Ed, who really taught you how to drive? My mom. I don't remember ever having "lessons" though, I just learned by watching and then by doing. I did take Driver's Ed, though. I woke up, watched a little news, took a shower, make-upped and hair-styled, then drove less than a mile to work. And now I'm at work. Used to be. Lately I'm not. I think my crier is broken. Or worn out, perhaps. 8. Have you ever had the same dream more than once? I have had recurring dreams about being chased. They're not the same. I haved also dreamed about being back in school (usually high school) and sometimes it's my high school, sometimes I'm at a new school. Eventually, in the dream, I realize that I graduated high school already and don't have to be there, and the dream always ends. I haven't had either dream in a long time. 9. If you were in an emergency situation and you had to deliver a baby, could you? Heck, I dunno. Would I have a cell phone where I could call my sister the doctor for instructions? Or 911? Or anything? I could catch a baby if everything went according to nature's plan, I suppose. 10. What was the most recent thing you bought? Last night I bought two bottles of wine to take to dinner at a friend's house. 11. What is on your refrigerator door? Nothing. On the SIDE of my refrigerator is a calendar, my work schedule, some of my favorite Notes from the Universe, and a NFL schedule. 12. Name something you have to do tomorrow. I have to go vote early. And also go through boxes and purge stuff. I'm moving into a different apartment and I need to get rid of some things. 13. Would you ever want to swim with the sharks? 15. What was the last thing you ate? I borrowed this from Sera Strawbridge who borrowed it from Ajooja who borrowed it from LeSombre. 1. Who did you last shoot a dirty look at? Huh. I can't really think of doing that. 3. Have you ever had a garage sale? Only once in my adult years. I can't remember if I made very much money, I just remember that it SNOWED in MEMPHIS on the one freakin' day I was going to have it. Talk about a business killer. I had to repeat it the next weekend and had it indoors because I'd already moved out of my house, so everything that was left was for sale. 4. What’s for dinner tonight? I don't have any idea. Maybe homemade pizza. 5. What is the last drink you drank? 6. Last time you were sick? In May I had a terrible, awful, no good, very bad respiratory infection. Hacking cough, completely stopped up nose (to the point I made funny nose noises when I tried to swallow), etc. It was not cool at all. 7. Are you happy right now? Yeah. Mostly. Lots of changes are happening in my life right now, but I'm rollin' with it. 8. What is your favorite key chain on your keys? It's a Memphis purse hook thing. I can't find a place that's selling it still, although I've seen them before at Tiger Book Store and Tennessee Sports Zone. 9. What is in your pocket? 10. Who is the last person you had a phone conversation with? The last non-work-related phone call was with a co-worker of mine who just found out that the baby he and his wife are expecting is a girl. Yay, girls! 11. What’s something fun you did today? I slept late, that was fun. Actually I woke up super early (like 5am), laid there for a couple hours, and finally fell back asleep. 12. What are you going to do after this? I need to be sorting through my stuff and packing boxes (I'm moving again), but I'll probably sit in my comfy chair and clear out my DVR. That's much more appealing. 13. What is something you need to go shopping for? I need some new flannel sheets and a long winter coat. 14. What was the last thing someone you love said to you? 15. What is a compliment you receive way too often? I'm having trouble coming up with blog material. My mind just ain't workin' that way anymore. So instead, I thought I'd share the things that I'm reading online today to fill my time. Babies Don't Lie: A great election post-- one of my favorites of the whole election cycle. It's partisan, but not offensive if you don't agree with the blogger's position. Just cute and funny. Guarding Her Nap: The sweetest Daily Coyote post EVER. Seriously. And if you're not enjoying the daily cuteness of this site, you should be. Black Heels to Tractor Wheels: the series of blog posts in which The Pioneer Woman shares the story of how she met a cowboy and it changed her life. Full Court Press: "During this 10-episode series, Rivals.com goes behind the scenes of the Memphis Tigers basketball team as they prepare for the 2008-09 season. With unfettered access to the Tigers and their coaches, new episodes of “Full Court Press” debut each week through Dec. 17." Nope, no golf in the winter. ;) The course will be covered in feet of snow, so the Members can cross country ski or snowshoe on it. The Club gets very slow in the winter, except at the holidays. We are not right on a mountain, so we don't get a huge ski crowd. The summers here are CRAZEE because we do a lot of golf and fly fishing. I'm looking forward to the winter, though, it'll be a nice long break. I took this picture last week while taking a drive to see the fall colors. Actually, many of the leaves had fallen already, but there will still many beautiful views. I took so many pictures, but this one is my favorite. 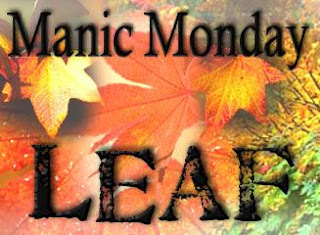 I'm participating in Manic Monday today with the theme of Leaf. Click here for more about Manic Monday and to view other participants.